Zebra villa is great if you’re taking two other couples or older kids traveling with you. It’s near Meads Bay, but far enough to have privacy. Plus, the bedrooms are all spread out over two levels and a guest cottage, so no one will feel piled on top of other guests. Walk to Meads Bay beach! 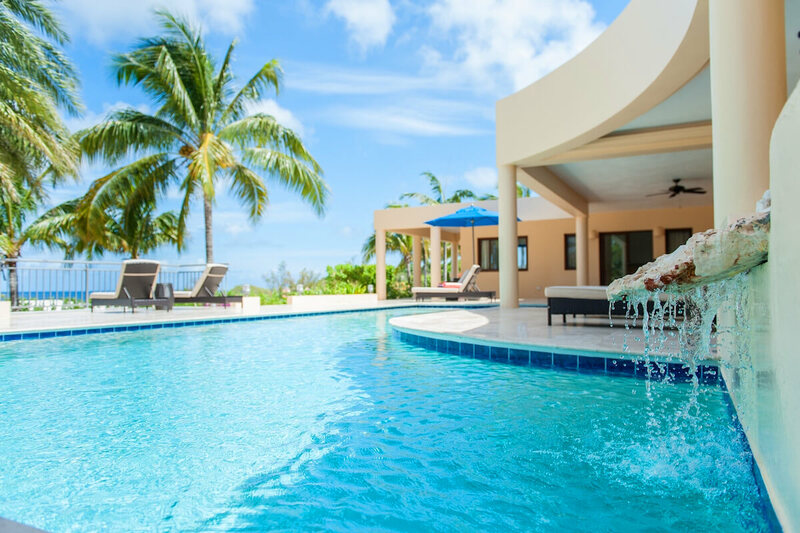 Zebra villa is a great option for couples or families looking to be within walking distance of Meads Bay Beach. This villa is surrounded by lush tropical gardens and has cheery, welcoming interiors. The L-shaped pool sits in the center of the patio, and several loungers sit around the sides soaking up the sun. The veranda provides shade for al fresco dining and leads into the common area. Muted neutrals decorate the living area, which has seating and a flatscreen TV. Purple cabinetry and a red accent wall contrast in the kitchen, which features basic appliances, a coffeemaker, dining nook, and cookware. This level also holds the queen bedroom, which has exterior access to the pool deck and an ensuite bathroom. The master bedroom stretches across the upper level and has a king bed, TV, and ensuite bathroom. In a separate guest cottage, there’s an additional king bedroom with a covered lounge area and ensuite bathroom. For extra sleeping, the office has a single bed. Housekeeping comes every day except Sundays and holidays to maintain the villa. Zebra villa is completely walled with a remote gate, and guests can follow the path outside of the back gate for a short walk to Meads Bay Beach. There are several beaches and restaurants available in a short drive. Bedroom 3: In a separate building off the pool patio, with covered lounge area and glass/screened panel doors. We had a great time. The villa was all good. Our experience with WhereToStay was all good. Our family of four loved calling the Zebra villa home for our week in Anguilla. The home was comfortable and just perfect - the kitchen had everything we needed, and the DR, LR, and the bed/bathrooms were spacious and nicely decorated. We loved the patio area with the pool (used everyday), dining table & chairs and lounge chairs. We also enjoyed being able to access the patio from the sliding glass doors in the kitchen, LR & 2nd bedroom. One of our favorite things about the villa was the water view from every room of the house, including the master bathroom! Having a deck off the master was excellent, too. Most days, we went to Meads Bay because the gorgeous beach is an easy 5-7 minute walk down the hill from the villa. On the beach, there are 4 chairs and 2 umbrellas clearly marked for guests of the Zebra villa [this was adjacent to the Malliouhana resort’s beach area (another bonus - you can rent SUP and other water sports equipment from them).] We loved not having to worry about toting anything but the beach bag and cooler! Also, the beach was never crowded. In fact, it often seemed as if we had the place to ourselves and we were there on a popular spring break week. The location of the villa was perfect - so close to many fantastic restaurants (you could walk or drive), close to the grocery store and best of all, view of water and walk to the beach! So many wonderful things to say about the Zebra villa, I could go on! We will return for another memorable island vacation! Amazing! Five stars PLUS!!!! We loved working with Shawna - she took care of every detail, from booking our travel on a semi-private boat shuttle from St. Martin to Anguilla, to securing the rental car and more. She helped us charter a boat one day and provided a list of restaurant and excursion recommendations. In addition, I appreciated the two page travel document she prepared in advance of our departure from the U.S. It was a detailed itinerary containing every piece of information we needed regarding the entire trip to and from Anguilla (including all our flight numbers, times, exact dollar amounts for the various taxes and fees, even the color shirt the person would be wearing who was waiting for us at the airport, etc.). She is extremely thorough and I hope to work with her again for every trip to the Caribbean that our family takes moving forward! We recently stayed at Zebra Villa for 5 nights and we could not have been happier! It is spacious and lovely and the pool is a great feature! There were five of us and there was more than enough space! We used the kitchen every morning to cook breakfast and even cooked two dinners. The villa is in a great location overlooking Meads Bay, it is very close to the Best Buy supermarket which is very convenient! The master suite was well appointed and you can catch some great sunsets from the roof! The road into the house is a little rough so I would recommend renting a SUV. Patra, who welcomed us, was great as well as Nadine, the housekeeper. Overall, we had an exceptional stay and will be back!!! Shawna from WhereToStay.com was excellent and met all of our needs! We absolutely loved our stay in Zebra Villa. Just a short walk up from Meads Bay Beach, it was the perfect location for our family. We will definitely be back. I highly recommend Wheretostay.com. Sharon was amazing to work with and definitely knows the island well.